“Copywriting that sells…”. Let’s face it: Those words are redundant. Why? Because by definition, copywriting is supposed to sell. It’s the art and science of selling through the written word. And if you are going to enjoy the high degree of online marketing success you want, and your small business needs, you have to have persuasive copywriting. No nifty new tool will take its place. For example, although not new, we hear a lot about video marketing. Well guess what? Video marketing won’t sell just because it’s using a popular technology. You still need the right words. So how do you go about writing the right words? I’m excited to talk about this, but first, understand this: You won’t read one article and become a competent copywriter. Copywriting is a specialized skill that take time and effort to develop. Done right, it bears little resemblance to the papers you wrote in high school English. And even having an English or journalism degree is inadequate preparation to produce great copy. Business owners, marketers and even professional sales reps often make a crucial mistake. In their efforts to try and persuade their potential customers, they talk on and on, in print or face to face, about themselves. About their company. And about their wonderful product or service. But that’s not what your readers want to hear about. They want you to talk about them. They care about their wants and needs. To the extent they do care about your product or service, it’s only because of what they hope it can do for them. They have a pressing problem, and they want you to help them solve it. So to get their attention (always a challenge in this crazy, fast-paced digital world) talk to them about them from the get-go. Talk in emotional, empathetic terms about their problem and how you can help them solve it. You can forget about using complex words and sentences and long paragraphs. Using the jargon and vernacular your audience uses. Write to them in a fairly basic way. Incorporate lots of white space – space on the screen not cluttered by text. Keep your sentences short. Make your copy easy to read. If it’s drudgery to get through, how successful do you think it will be in helping you make sales? Will readers even finish it? Doubtful. Don’t just make your message easy to read. Make it crystal clear. There should be no doubt what you are trying to say. If your reader is scratching his head while trying to figure out your message, it doesn’t bode well for your sales results. Here’s something else important, and it closely relates to making your message about your reader instead of you. Don’t ramble on and on about your product’s features. Talk instead about benefits. Tell your reader how she will benefit from buying and using your product. But here’s a catch: Make sure it’s a benefit your reader cares about. Let’s say you are selling a workout program readers can follow at home. Your reader cares about looking good and being active. Your workout can help with both of these. So mention them. Let’s say also your program can lower high blood pressure. That’s a benefit. But if it’s not a benefit your reader cares about, don’t mention it in your copy. If you do, don’t make it a priority. In other words, you have to know your reader well. And speaking of benefits, don’t just list the benefit. Go a step further. Paint a vivid word picture – write a story in which the reader can see himself not just enjoying the benefits of your product, but experiencing the wonderful lifestyle it enables. Remember that people make buying decisions emotionally first, then justify their decisions with logic. Once you’ve poured on the emotion by talking to them in a way that drives home how frustrated they are about their problem, once you’ve painted your emotional word picture of them enjoying your product, you need to offer some logic to help them justify their decision to buy. This could be in the form of a no-risk money back guarantee. It could be in the form of a detailed explanation that shows how they will save money by investing in your offering. And by all means, offer proof, especially social proof. Have reams of testimonials, especially video testimonials, on your site. Want Their Business? Ask For It! As I said earlier, copywriting is selling through the written word. A big part of selling is asking for the business. So in your copy, ask for their business. Ask your reader to specifically take the next step you want him to take. This will usually involve clicking a link to go to another page, perhaps an email signup form or a landing page to download a special report or other type of content you are offering. In the online marketing world, “conventional wisdom” that is loaded with misconceptions and half-truths abounds. Something many believe, that is not true is this: No one reads long-form copy or content anymore. Not true. If your reader finds your message compelling, interesting and entertaining, if it is giving him hope for a solution to a problem he is tired of struggling with, if it is focused on him in an empathetic way, he will read it. The word count doesn’t matter. Remember that copywriting is selling through the written word. Would you send a sales rep to an appointment with instructions to “use this many words and no more”? Of course not. You want her to speak as many words as are necessary to make the sale. The same goes for your copywriting. 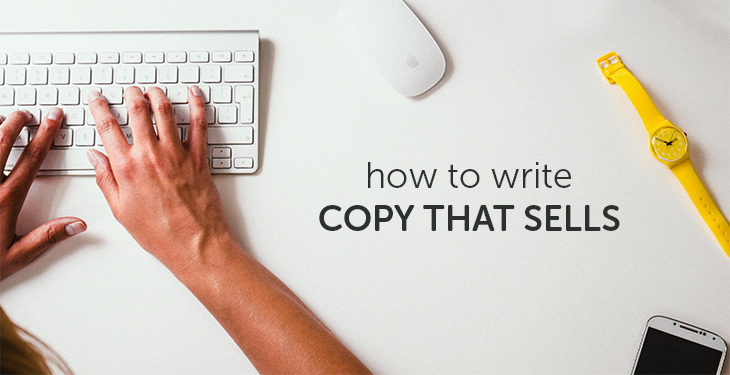 Copywriting is too broad and detailed a subject to be handled by one brief article. There are plenty of free resources that can help you learn more. Want one of the very best? Copyblogger is loaded with valuable insight that can help you learn more about the all-important business skill that is copywriting. By the way – Are you looking for simple, easy-to-use sales and marketing software that can help small businesses like yours turn emails into conversations, website visitors into handshakes, and customers into raving fans? Click here now to find out more!